Definition at line 234 of file BasicAliasAnalysis.h. Definition at line 2029 of file BasicAliasAnalysis.cpp. 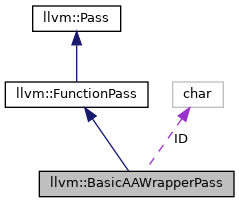 References llvm::PassRegistry::getPassRegistry(), ID, INITIALIZE_PASS_BEGIN(), INITIALIZE_PASS_DEPENDENCY, and llvm::initializeBasicAAWrapperPassPass(). 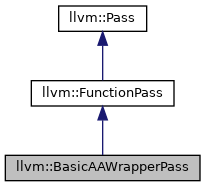 Definition at line 2064 of file BasicAliasAnalysis.cpp. Definition at line 244 of file BasicAliasAnalysis.h. Definition at line 245 of file BasicAliasAnalysis.h. References llvm::createBasicAAWrapperPass(), llvm::createLegacyPMBasicAAResult(), F, P, and runOnFunction(). Definition at line 2049 of file BasicAliasAnalysis.cpp. References F(), llvm::Module::getDataLayout(), and llvm::GlobalValue::getParent(). Definition at line 240 of file BasicAliasAnalysis.h.